I'm Amy and I am stay-at-home mom to two beautiful toddlers who keep me running all day! Since I have had children I am persuing my dream of decorating full time. Please follow me on my journey of transforming boring or ugly spaces, creating fun and thrifty craft projects, cooking and entertaining, and just enjoying this crazy life I live! What do you think of decorating with cowhide? Some people love it, animal activists hate it. I happen to LOVE it! 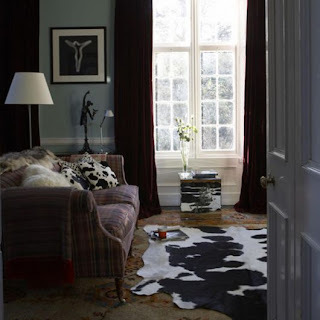 Cowhide seems to be popping up everywhere in the home decorating world. I don't yet have anything in cowhide. I have looked at buying them several times but couldn't ever get past the price. I would love to find a small piece that I could use to cover a footstool or ottoman, or even the seat of a chair. I think it adds a touch of rustic elegance and I think it is sooooo fun when done right! I would hardly call my decorating style Western. It is actually more Traditional, but I love a touch of flair, whimsy, and just plain unexpected, yet elegant at the same time. I once stayed at a hotel/resort in Texas called the Texas Gaylord, and it had cowhide covered bar stools in one of the bars with dark slate floors. That may have been when my love affair with cowhide started. I'm curious to know what you think about decorating with cowhide. And if any of you know where I can find it at a great price, by all means let me know!! I adore the cowhide! 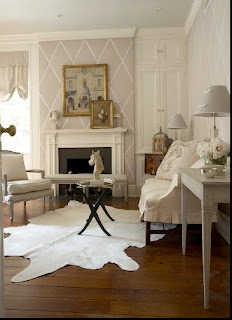 I am a little more traditional too but love touches of whimsy in a room! Rooms are no fun when they take themselves too seriously;)! Your blog is wonderful! You are going to love blogging. It is so much fun and you meet the loveliest people! Good luck...you are off to a great start! I think as shown in your photographs the cowhide looks very elegant. I suppose it all depends what you pair it with. Have a great weekend! Hi Amy! I'm so excited about your blog....can't wait to see more. I love the look of cowhides too.... Ikea actually carries them, they still aren't cheap (249.00) but still better than most. Not sure if you have an Ikea close by though. Good luck on your blog!